COCKRELL, Jeremiah Vardaman, (brother of Francis Marion Cockrell), a Representative from Texas; born near Warrensburg, Johnson County, Mo., May 7, 1832; attended the common schools and Chapel Hill College, Lafayette County, Mo. 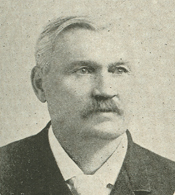 ; went to California in 1849; returned to Missouri in 1853; engaged in agricultural pursuits and studied law; entered the Confederate Army as a lieutenant and served throughout the Civil War, attaining the rank of colonel; at the close of the war he settled in Sherman, Grayson County, Tex., and engaged in the practice of law; chief justice of Grayson County in 1872; delegate to the Democratic State conventions in 1878 and 1880; moved to Jones County; appointed judge of the thirty-ninth judicial district court in 1885, to which position he was elected in 1886 and reelected in 1890; elected as a Democrat to the Fifty-third and Fifty-fourth Congresses (March 4, 1893-March 3, 1897); was not a candidate for renomination in 1896; engaged in farming and stock raising in Jones County, Tex. ; died in Abilene, Tex., on March 18, 1915; interment in the Masonic Cemetery.